Tenix Defence Systems Pty Ltd. 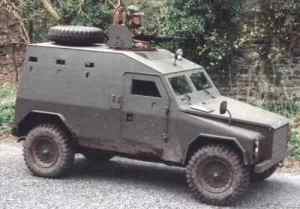 The first Shorland armoured personnel carrier, the SB 301, was developed as a private venture by Short Brothers of Northern Ireland with the prototype completed in 1973 and the first production vehicle the following year. The Shorland designed specifically for internal security operations and is based on operational experience obtained with the Shorland armoured patrol car (4 × 4), with which it shares many common components. 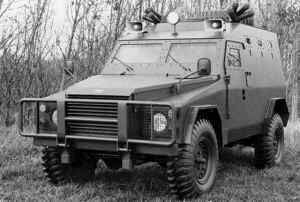 The Shorland SB 401, with strengthened armour and the more powerful V-8 petrol engine was introduced in 1980. The more recent version, the S 55, was designed to take advantage of the Land Rover Defender 110 (4 × 4) chassis with its improved coil spring suspension and wider wheel track. Other improvements introduced with the new chassis were improved performance, a tighter turning circle and power steering to reduce driver fatigue. Late production Shorland vehicles have a redesigned bonnet for easier engine access, bullet-resistant glass windscreen and windows and eight firing ports, each with a vision block above. Of these, there are three in either side of the hull and one in each of the rear doors. 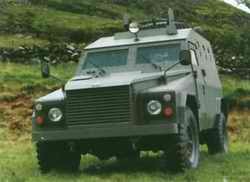 The complete Shorland Series 5 family comprised the S 52 armoured car, the S 53 air defence vehicle, the S 54 anti-hijack vehicle and the S 55 armoured personnel carrier. Details of the S 52, S 53 and S 54 vehicles are given in the entry for the Shorland armoured patrol car. Short Brothers sold the complete design, development and production rights of its extensive range of 4 × 4 armoured vehicles to the now BAE Systems Australia. 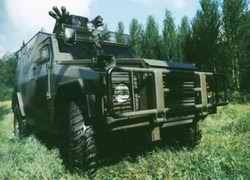 Early in 1999, Tenix Defence Systems acquired all of the vehicle business of the now BAE Systems Australia including the S 55 and other members of the Shorland family of light armoured vehicles. This also included the new S600 covered in a separate entry. As of early 2008, the S600 had been sold to at least three countries Belgium (at least 8 units), Kuwait National Guard and (22) Singapore (2) with production being undertaken on an as required basis. The S 55 is based on the 110 in heavy-duty Land Rover Defender chassis, which has permanent four-wheel drive and a lockable central differential. Normal power pack is the 3.5 litre Rover V-8 petrol engine with the Rover 2.5 litre turbo-diesel available as an alternative. The chassis has been strengthened to take the all-welded steel armoured body and is fitted with stronger axles and suspension and different final drive ratios. Nevertheless, some 85 per cent of the automotive and mechanical components are stock Land Rover parts, so reducing spares and maintenance problems. The vehicle body of the S 55 provides protection against right-angle fire by NATO 7.62 × 51 mm ball ammunition down to 25 m range while the bullet-resistant glass provides the same level of protection as the steel and meets the test requirements of BS 5051 Part 1 Class R2. The engine and radiator are fully armour protected while the floor is made from reinforced glass fibre to give protection against mines and improvised explosive devices. The fuel fillers are under armoured hatches, which can only be released from inside the vehicle. The roof of the S 55 is sloped so that hand-thrown objects roll off even when the vehicle is stationary, and the bonnet and windscreen assemblies are designed to ensure that burning fuel from petrol bombs thrown against the windscreen is directed to the ground without entering the engine compartment. 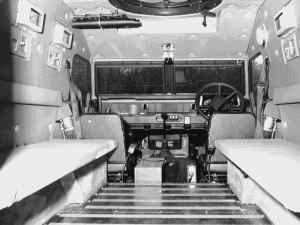 A searchlight, controlled from within the vehicle, is mounted in the forward part of the roof between the driver and commander seats. The vehicle is designed to carry eight personnel including the driver and commander. The two side and two rear doors permit easy entry and exit and a grab rail suspended from the roof assists rapid movement in operational emergencies. The large bullet-resistant windscreen and side windows provide excellent visibility for the driver and commander and eight gun ports with associated vision blocks are fitted, three on each side and one in each of the rear doors. Optional equipment for the S 55 includes run-flat tyres, drop-down visors with bullet-resistant vision blocks over the bullet-resistant windscreen, police/emergency lights either as individual lamps or as part of a multifunction unit, a public address system, automatic fire protection and a roof hatch either with or without a machine gun mounting. Fixed grenade launchers can be fitted which can fire 66 or 76 mm electrically initiated smoke/illumination/CS gas grenades. Production complete. No longer manufactured or marketed. The S 55 is in service in over 20 countries including Malaysia. In January 1988, Shorts Brothers announced that it had been awarded a contract to supply 40 S 55 Shorland APCs to the Turkish Ministry of the Interior, to be used by the gendarmerie. In June 1990, Shorts Brothers announced that it had been awarded a contract to supply 24 Shorland S 55 APCs to the Sindh Police of Pakistan. Late in 1993, Shorts Brothers announced that vehicles had been ordered by the Papua New Guinea Defence Force and by television companies for the protection of film crews operating in the former Yugoslavia. Показания к проведению урологического массажа.